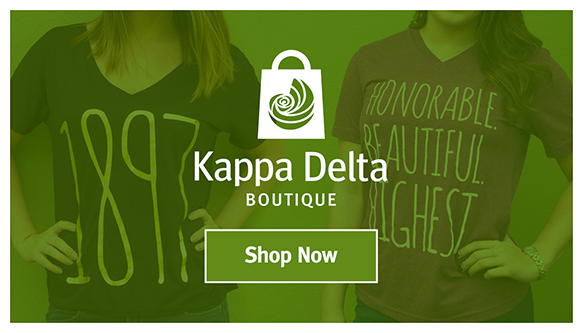 Kappa Delta Sorority is committed to building confidence and inspiring action not only in members but others as well. 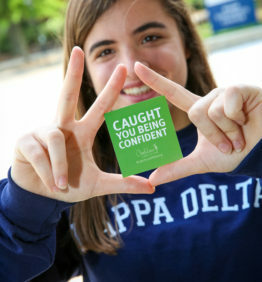 In 2009, Kappa Delta created the Confidence Coalition, an international movement that encourages all women and girls to embrace their uniqueness, live courageously and build confidence in one another. We invite you to take the Confidence Pledge and join the movement! Print the Confidence Pledge to share with others or post it in a prominent place to remind yourself to go confidently! Download here. Distribute “Catch Confidence” cards to women and girls in your community. Write an encouraging message on the back of the card and share it with someone who you catch being confident. Order cards here. Plan a “You Make Me Smile” campaign. Write positive messages on blue balloons and hand them out around campus or in your community. Or write uplifting messages on sticky notes and place them on bathroom mirrors and other places where people will find them. Recognize special friends during International Women’s Friendship Month in September. After all, friends build our confidence! Plan confidence-building activities for girls on or around Nov. 14 in celebration of International Girls Day.